My weekend outfits can almost always be defined in two adjectives; comfy and cosy, especially with fall finally hitting hard. Which is why I am happy to see Pleated Skirts not going anywhere this season, talk about comfy yet stylish. I wore pleats in the spring, last fall and this year I'm at it again. There's nothing more feminine than a piece that has pretty pleats, so you can imagine my excitement when I saw this ladylike skirt being a hit on fall 2016-2017 catwalks. Coming in silver and gold at Gucci, in lurex at Max Mara, in colour blocks at Tommy Hilfiger and in velvet at Valentino, it's safe to say that pleats are once again having a moment in fashion. Having said that, pleats are not as easy to wear in the fall as they are in spring. In the spring pair it with barely there sandals, a cami and denim jacket and off you go. However, when temperatures outside don't allow for such get up we need something a little warmer, and to think outside of the box. 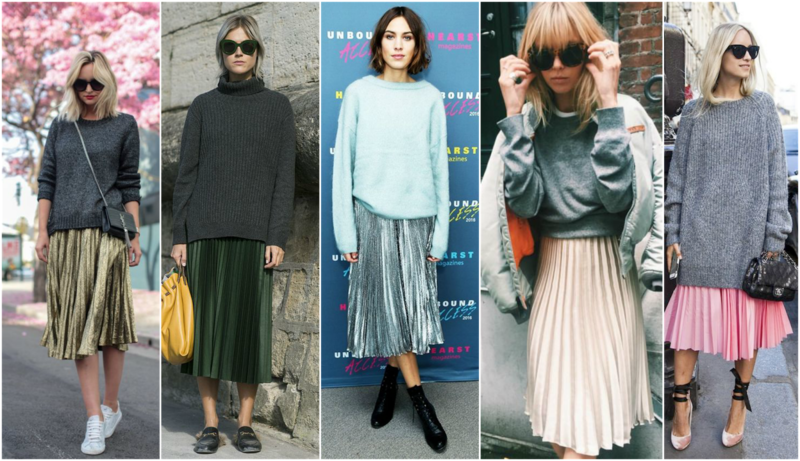 To make it seasonal and cool, the easiest way to style a pleated skirt is by adding an Oversized Knit. By teaming up the chunkiest (and cosiest) sweater you own with a feminine skirt, a dress-down take on this oft-smart item is the result. Now I know this look is bold and definitely not for everyone but I like how edgy and out of the ordinary it looks; it is a stylish way to put these two very different pieces together. For shoes, you cannot go wrong with either lace-up heels for a casual romantic dinner or a pair of sporty trainers (think Stan Smiths or plimsolls) for the perfect look for brunch. I personally am loving Metallic Shoes and after frantically shopping around for a pair, I decided on these gorgeous plimsolls from Stradivarius. I originally wanted a pair of silver brogues but after having tried different ones from the likes of Zara and Missguided, none of them seemed comfy enough compared to these trainers. Did I need another pair of trainers? No I most certainly did not, but it was Friday after work, I had had a long and busy work week so I just went ahead and treated myself, no regrets! Needless to say, I am obsessed with them and they have not left my feet ever since so do expect to see a post entirely dedicated to them in the near future, haha. For accessories I mixed different shades of metallics and I am so glad the paradigm of only wearing one specific colour is so last year. If you didn't already know, mixed metallics is a thing so start pulling all of your shiny, shimmery pieces out of your closet and mix and mismatch like there is no tomorrow. Rock this trend by combining hints of metallics in your shoes, bag, clothes, and even nail polish. Phew, that's a lot of trends in one post! What do you think of the knit and skirt combo? What about metallic shoes? Let me know below! Thanks for reading beauties and happy Thursday! Gostei do look, mas em mim não gosto de ver sais plissadas...pode ser que um dia mude de ideias! You create a very beautiful look! Its so elegant and trendy at the same time!!! I Like this! and I'm going to try it out. Especially because I've got the green Zara pleat and a pretty Orange one as well! Whooop. This is such a pretty look! I have a a jumper just the same so I think I will try and rock this soon, if I'm not to cold haha! You look gorgeous! What a cute and fab fall look! This is a trend that I can see myself in, Pam! I love how effortlessly chic the look is. I am in love with this look. This is so something I would wear. Que lindo look arrasou imagens, obrigado pela visita. I have a pleated skirt I have not worn in a while, after reading your post I might need to take it out ! OMG!! I love the shoes!! Loving this look! So elegant yet it has a hip spin to it. Love the shoes Pam, so magical!! This outfit is gorgeous! Love your make-up too!! Loving how you added the sneakers to the skirt! Such a fun combo! I am slightly obsessed so fun! Super adorei o look,ficaste muito linda e encantadora!! Beijinhos fofinhos!! Amazing Outfit ! Loving your sweater and your skirt! Pretty Must-Haves. Love this skirt on you, these sneackers look perfect with this outfit. Love that sweater and pleated skirt! Comfy and cool combination! Love how you've paired it with the metallic shoes! So casual but cool! I think we know each other for some time and we can be honest :) I loooved the outfit, I love pleats and you look very beautiful - but I confess I couldn't read the post, because in the next 10 min I am being expected to a weekend trip. But I didn't want to leave without commenting, you are always so sweet towards me! I hope you have a lovely weekend, dear Pam! Your outfit is so on point! I love the oversized sweater with sneakers! Love the combination! Lovely skirt! "comfy" and "cozy", you got it spot on! I would never think to wear these items together but they look fantastic on you! These skirts do not look good on me....I look like a blimp, but I am loving the way these look on you. Super cute!